I've been a bad food blogger this past week. What can I say - it was a boring food week! We cooked, but we didn't try anything new. We had desserts, but nothing special or new. Boring Food Blog this week - sorry! Of course, in non-food news it was an 'exciting' week, but not in a good way -- the stink bug invasion finally hit our house full force. I cannot open the windows. Somehow, they sneak in and hang out between the screen & window. What's worse, many of them worm their way around/through the closed window and into the house. Sigh. They freak me out. They're bugs. They're kind of big bugs. They can fly. They make a scary buzzing noise when they fly. They creep. And they stink, if you scare/excite them or squish them. They stink kind of like really, really, really, really super bad, super sweaty, super stinky BO. Yes, I just wrote about stink bugs on my food blog. A rant about the stink bugs that gather on the rear house windows around 11 am and by 3-6 pm have sneaked into the kitchen to terrorize me. I try to catch them -- there's always lots of juice glasses with stink bugs trapped underneath, sometimes I get them into a ziploc bag, BUT... One day there were 15 inside and many, many more on the windows. Help. I'm not good with bugs. I send SP frantic text messages to come home ASAP and save me. I cry in frustration and fear and annoyance. My house is so darn clean. The cleaning lady was just here on Monday, how dare these bugs invade and make me feel all filthy!! One night, I knew there were 5 loose in the house because right before SP got home, I counted the ones I saw crawling around, out of my reach. I knew they were lurking, hiding, waiting to scare me. I kept looking and prowling around all night, trying to spot them, but they were crafty. Then, the next morning, one of them got me - I went to get a bowl and there it was, hanging out inside the cabinet on my white bowl. AARRRGGGHHHHHHHH. ON THE DISHES. I loaded that bowl and about 5 other nearby bowls into the dishwasher. Yup. I'm that paranoid and freaked out by them. I never thought I'd say this, and I love fall, it's my favorite time of year, but please, please bring on the cold weather to make these bugs go away! This week continued the trend of SP working late. On his way out one night, he was the last person to leave, and he saw the last donut from a box that a co-worker brought in. A poor, lonely Dunkin' Donut. So he grabbed it, thinking he'd snack on it in the car. But then he remembered the 'rules of the new car' - no food that will make a mess. That means no sprinkles! They just jump off and zip around the car and then the pretty new interior will have donut sprinkle mess! So he brought it home and we shared it for dessert. 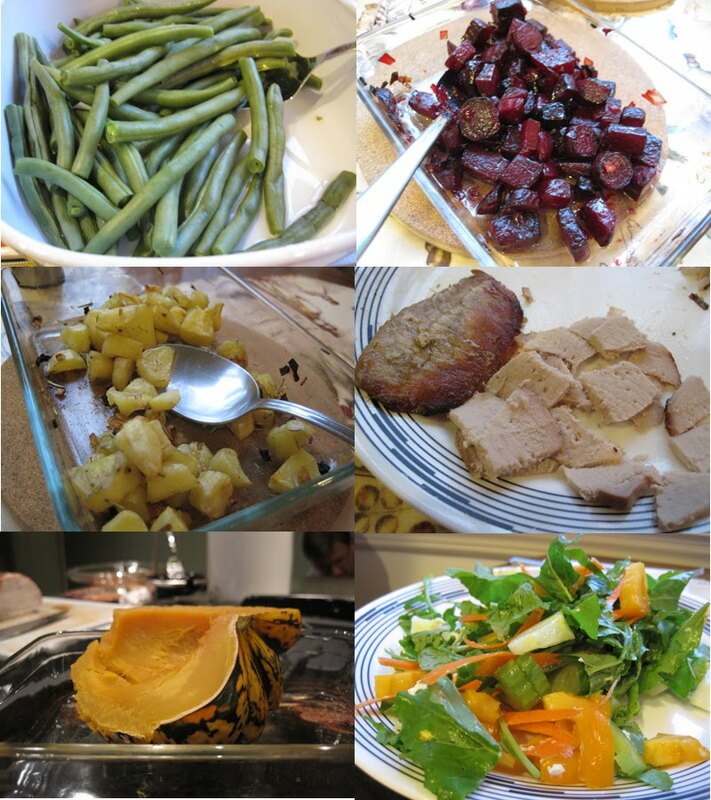 Dinner: The foods in the above photos fed us for 3 days! Steamed green beans from Original Farmers Market, roasted beets with shallot, roasted fingerling potatoes with shallot & rosemary, pork roast, roasted carnival squash from the CSA, and salad (CSA arugula, carrots, celery, CSA goat cheese, CSA heirloom tomatoes, cucumber from Original Farmers Market and homemade balsamic dressing). The recipe we used for the pork roast is actually for pork tenderloin. It works OK with the bigger roast, but is definitely better with tenderloin. When the pork was gone, we ate Chef Salad and made grilled cheese for dinner. I wanted to use up some milk, so we made instant chocolate pudding: Yes, I know, it looks funny. We tried to top the pudding with whipped cream from a can, but the can was almost empty so the cream came out very runny. No nice swirl on top. Just a runny blob. Ick. I tried to quickly scrape off all the runny whipped cream but is was so runny it just oozed into the pudding. Oh well. It tasted OK.
And that's our not-so-exciting food week! The little brown tanks invaded my house a few weeks ago, right before I left on vacation. They hung around outside the house for a decent part of the summer, but one day one of them got in... and followed me around to every room in the house. I think they must be attracted to light, because this one went into whichever room had a light on. I can't even say for sure that it ever left - I left for work the next morning and it was still there, but when I came home (poised with an empty salsa jar to catch it), it was nowhere to be found.